If you were to ask us what we thought was the last bastion of goofy, unadulterated fun, we’d point you in the direction of Sandlot and D3Publisher’s Earth Defense Force series. If you took the campiness of Starship Troopers, threw it into an arcade shooter where you fight off literal giant ants, you’d end up with this series. And we wouldn’t have it any other way! 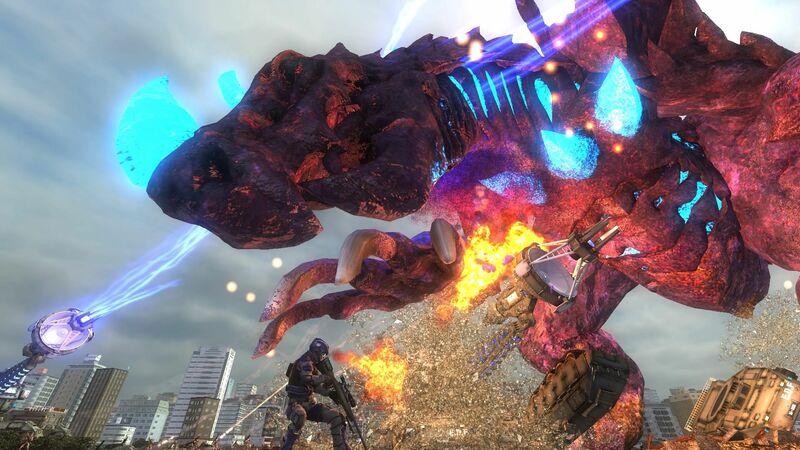 The last entry that we received outside of Japan was Earth Defense Force 4.1 The Shadow of New Despair. In that game you played as an EDF soldier with up to three other players in an all-out war against a new kind of threat. In addition to the killer giant bugs, you had to deal with new robotic enemies that utilized new technology we’ve never seen before! If you’re unfamiliar with the franchise, we’ll break it down for you. You get to pick one of four classes that each specialize in different weapons and abilities. The all-around Ranger can use standard guns but also had leadership skills that could support the party. The heavy duty Fencer was a one-man walking fortress with access to extremely powerful guns. The nimble and lightfooted Wing Divers could fly and dance around in the air, letting them hit enemies in their weakspots. Air Raiders could dominate the battlefield by calling in air support, tanks, mechs, and more! The game play in this series is extremely simple, but that’s part of charm. You pick your class, head into the heart of Japan, and start blasting giant bugs! Like we said, it’s pure unadulterated fun that harkens back to the good old arcade days. Blow up big ants, unlock bigger weapons, and fight off the biggest enemies you’ve ever laid your eyes on. Earth Defense Force 5 doesn’t seem to different in terms of game play mechanics, but we’re not complaining. As long as we get new baddies to fight (watch the trailer to see giant frogs with giant guns), new weapons to play around with, we’re content little soldiers! Earth Defense Force 5 is releasing in Japan on December 7, 2017, with a western release coming soon after.